A canal separates the monument-rich “inner city” of old Vienna, Austria, from the newer neighborhoods to the east. Behind those housing districts is a sprawling park named the Augarten, where citizens and tourists can frolic or exercise or relax. 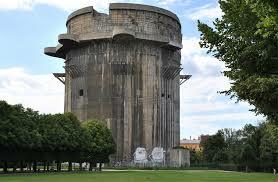 However, the Augarten has two squat, ugly towers that look out of place. In fact, they are — ugly and out of place. Each of the buildings is an imposing mass of reinforced concrete, and each was designed, in the latter years of World War II, to have two functions: 1) As gunnery strongholds to shoot Allied planes out of the air and 2) as a bomb shelter for Vienna’s civilians. Right there next to the enormous park are two “flak towers”, mute reminders that Austria fought on the side of Nazi Germany in World War II and, actually, was a constituent part of the German “Reich” — having been annexed to the rest of Germany in 1938, a year before the Second World War began. For decades after the war, Austrians liked to describe themselves as Hitler’s first victims … but the popularity of the political move to join Austria to Germany was strong on both sides of the old border between the German-speaking states. A plebiscite in the former Austria showed overwhelming support for joining up with a Berlin-led Germany. Those results likely exaggerated the support for the move, but most historians believe the majority of Austrians were for it. For the next seven years, Austria’s economy and population were as one with Germany. When the Soviets pushed the German armies back to their eastern borders, the Third Reich fought hard for Vienna which was, after all, the second-biggest city in the Nazi state. Austria now is trying to figure out what to do with the flak towers that were left behind, like the two in the otherwise serene Augarten park. One potential use is as a storage depot for government data. The towers in Vienna are so heavily built, a safer place for information would be hard to imagine. Seven-plus decades after the war, many tourists — and perhaps some Viennese, too — do not know for what purpose the concrete towers were built. Abandoned grain silos, maybe? It is hard to blame the Austrians for a little selective memory loss. Since 1945, when WW2 ended, Austria has been steadfast in its desire to be its own political entity. And its people have made clear that they consider themselves Austrians — not Germans who happen to live in Austria, as was a common frame of mind, before 1945. Vienna is a capital again, albeit of a small and militarily weak Austria stripped of its imperial possessions in 1919, after the First World War. Austria is home to about 9 million people who have left behind their history, and the now-prosperous Viennese seem to like it that way.